These Rip Curl Boots are running smaller than others. We are suggesting going up at least a whole size from your normal shoe size. If you have any doubts or questions call 503-738-7888 or 888-546-6176 or use our contact us page. 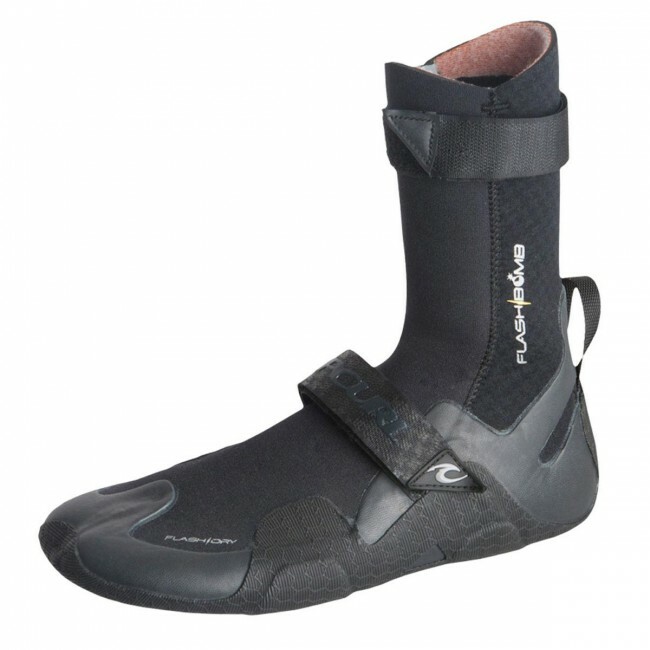 The Rip Curl Flash Bomb 3mm Hidden Split Toe Surf Booties are made for cool to cold water, and provide your feet with warmth as well as protection from the sun, and rough ground. Well built, and the flash dry lining makes slipping them on and off a breeze. I tend to wear a 10.5 (US) in shoes, so I ordered a size 10, because neoprene tends to stretch out. They run a little bit smaller than same sized O'neill booties, and ended up irritating my toes the first few sessions. Since half sizes weren't available, I think I made the right choice, but it's still worth being aware of.